A great dose of classic Battlestar Galactica goodness for those who fell in love with the original series back in 1978. I always enjoy those #0 issues, because they often herald great things to come. In this case, the cover alone gave me goosebumps. Its design was highly reminiscent of the original Marvel Comics series, which I still treasure today. It brought back some very happy childhood memories. When you turn to the first page, the feeling that you’ve stepped into the past only gets stronger. The black and white introduction page featuring the triumvirate of Apollo, Starbuck and Boomer made me grin in anticipated pleasure. And it only gets better from there. There have been many comic book stories set in the world of the original Battlestar Galactica over the years. And one of the things I liked about Moore’s reimagining of the original saga is the fact that it also breathed new life into the old series, at least in comic book format. Over the past years, we’ve seen more comic books based on the original series than ever, and that is a great thing. 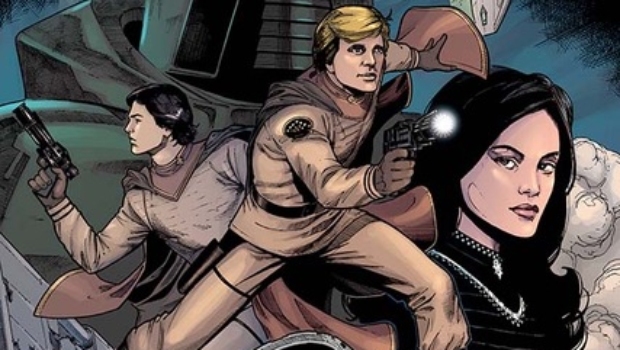 The Battlestar Galactica “expanded universe” may not be as important as Star Wars’ EU, but it has pounded out some good books (comics and novels) over the years. The original Marvel Comics series is the one that I remember most fondly. For me, the Marvel series came at a great time, long before VCRs would become common place. So, back then, the comic books (and the original series of paperback novels published by Ace/Berkley) were the only BG fixes to be had between episodes—or after the series was canceled. When Walt Simonson was not drawing it, the art was not always the best that Marvel could pump out at the time, but those comic books caught the spirit of BG in a way rarely seen thereafter—even in the novels published by such BG alumni as Richard Hatch. This latest series from Dynamite as previewed in issue #0 really brings me back to those great days. 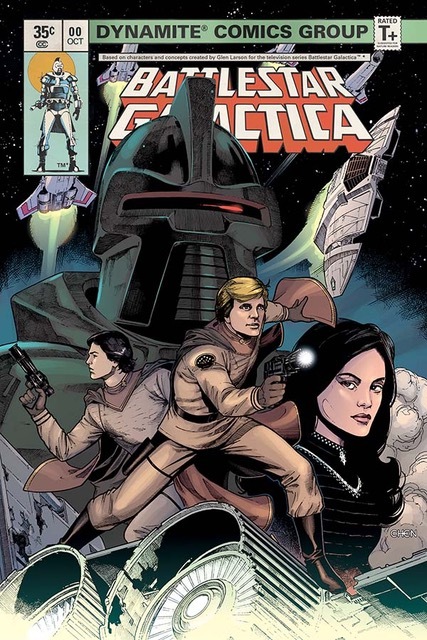 The art by Daniel HDR is impeccably respectful of the original Battlestar Galactica, and Natalia Marques’s colors only strengthen that feeling of being plunged back into the look and feel of the original TV series. The scenes between Adama and Colonel Tigh really look like they are happening on the Galactica and not on some generic spaceship. It almost feels like you’re back in 78 watching this story unfold on the screen. It’s a great feeling. 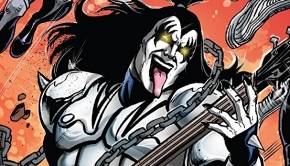 A well-made comic book based on a TV or movie franchise is always most appealing when characters are easily recognizable, not only in the way they are drawn, but also in the way they talk and behave. I’ve read too many comic books where Starbuck, for example, is a pale imitation of his original TV character. Art, dialogue and character development have to make the characters feel like the real things. The characters have to appear and behave like their televised counterparts, otherwise the book does not feel genuine and it is merely just another nameless space opera. The characters simply have to have it all, because even if they look the part, but don’t “sound” the same, I still feel cheated. When they both look and act like they do on the screen, the nostalgia-afflicted reader has a great book in his hands. I enjoyed this book because Adama looked and acted like Adama. So did Tigh, and Apollo—and of course, so did Starbuck. The only thing this book missed was Athena. I can do without Cassiopeia, but I missed Athena. (I’ll take Athena over Tricia Helfer’s Number Six anytime when it comes to my favorite Battlestar Galactica babe.) It’s still early, this was just a preview issue anyways, but I’ll be disappointed if Athena or any of the other old favorites don’t show when the series comes out. The book, unfortunately, also carries some of the flaws of the original television series. You can’t expect comic books to be great on science, of course, but there has always been something more terribly flawed with BG when it comes to space traveling, space fuel, distances in space, and so on. 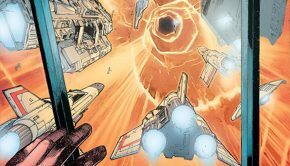 We happily suspend disbelief for any space opera franchise (like Han Solo’s 12 parsecs Kessel run), but when it comes to Battlestar Galactica, it always requires a little extra effort—at least for the more astronomically minded readers. It’s not impacting my enjoyment of the book in any way, though, but I so wish they tried to get it right in the new books. The “socio-political” interactions of the Colonials with the other alien races is where the joy gets dim a bit. Of course, when it comes to the old Battlestar Galactica, we don’t expect to see the same level of social complexity we saw in the reboot or in, say, Game of Thrones, but (light spoiler ahead), the interactions of the Viper pilots with the Okaati (a new race encountered by the Colonials) simply seem forced and too easy. They make friends so improbably quickly, and the dialogue is so precipitated that it simply hurts the story. Of course, this is a preview issue that had to wrap up within a few pages, so maybe writer John Jackson Miller didn’t have space to write more poignant interactions with the aliens, and maybe we can expect more complex interactions in the actual series when issue #1 comes out, but this diminished the experience for me to some extent. 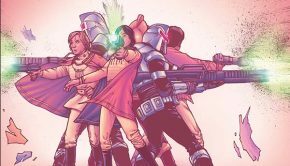 In short, this was a great preview issue for Battlestar Galactica Counterstrike coming out soon. If the art and writing keeps up, this will be a series not to be missed for any Battlestar Galactica fan.